How hot has it been lately!!?! It seems so unfair that the minute the children get back to school, the sun come out and it becomes beach weather! However, I have to admit that I’ve come to know that when I see a warm weather forecast, my heart will sink a little as my mind automatically adds extra glucose onto my shopping list, and makes a mental note to order more test strips and lancets. Hypos and heat….the two just seem to go together somehow for us! So along come extra carbs, temporary basal rates and prolonged night testing and mad dashes to school with extra glucose in hand. As for those little fingers. Well, I confess they have quite an effect on me. I often find that as I perch on the side of the bed at night and take a little soft pink finger and purposely line up a lancet, hold it to the side of her finger and press the button, my heart sinks. I watch as the deep red blob surfaces and then spring into action to test and correct or treat as necessary and watch as she sleeps through all this, flinches, or refuses in her sleep to respond to the need to make her body wake to treat a stubborn low. I rub a little cream into those sweet fingers before I tuck them back under the covers and then stop my sinking heart with a reminder of how resilient all this is making us. Especially her. Little constellations form on her fingers, showing where they have been previously pricked time and time again, and with this, a sense of determination can often be seen. Time has moved on, from being scared to test, to testing as routine. Our little children with T1D are absolute heros. Nothing can stop them reaching their goals, and they show determination as they get there, picking themselves up and trying again when things don’t go as planned. I thought about this last night as I tucked her little fingers back into bed, and stroked her hair back. My hero, with the badges to prove it. 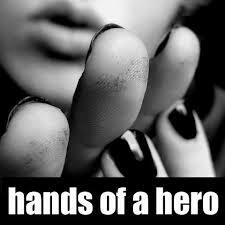 I found this picture that summed it up perfectly….our children with T1D have the hands and hearts of a hero.